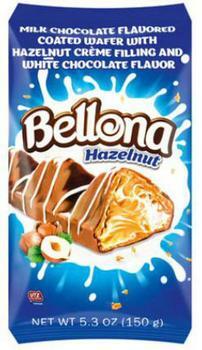 Lidl US is recalling all Bellona brand “Milk Chocolate Flavored Coated Wafer with Hazelnut Crème Filling and White Chocolate Flavor” confections. The product contains wheat, an allergen not declared o0n the label. The company has not received any complaints and is not aware of any allergic reactions. The recalled product was sold at all Lidl US stores. Customers who purchased the recalled product and are allergic to wheat should discard it immediately or return it to their nearest Lidl store for a full refund. Consumers with questions may call the customer care hotline at (844) 747-5435 from 8 am – 9 pm (ET) seven days a week.